As a blogger, I love Google Analytics. Yeah, yeah, it gives me great statistical information I can use to better my blog and blah blah blah, but I'm talking about the entertainment value. 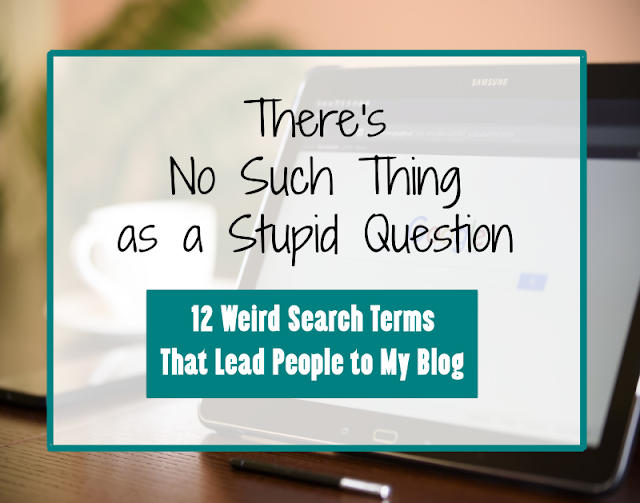 You see, I can see the search terms that led people to my blog, and you have no idea what strange questions and weird topics people have Googled and somehow ended up on Unremarkable Files. Because you're at your computer Googling? I would suggest maybe putting on a suit and getting in your car and seeing what happens. Yeah, me too. It's not your fault, it's just what happens after you have kids. My life is a funny reason for being late. You've come to the right place. Okay, I get it. This is like Jeopardy. What is, "compulsively counting heads when you go out in public"? What is, "eating birthday cake"? What is, "sorting through giant mounds of shoes in the mudroom to find a match"? I'm really hoping these are song lyrics or something. Because otherwise I'm thinking I should call the police. What a positive way to look at it! I'm going to start saying this to myself in the mirror every morning. Actually, this is what I say to myself in the morning. Sometimes it really freaks me out that this house, my van, and no less than 6 small people are all in my marginally capable hands. Surely this isn't the best idea. Not sure which is more horrifying, that someone searched for this or that I have a post on it. What's with all the 'uterus' searches, anyway? So thank you, people of the Internet, for following your bizarre search queries to Unremarkable Files. Even if I couldn't tell you exactly why you aren't at the beach, aren't you glad you came? Oh wow! I need to do that, so I can see what weird stuff brings people to me! Flying squirrel skeletons?? Really?? I gotta go check that one out!! I'm dying. Like, I have tears in my eyes right now-these are the best! I'm intrigued by all the uterus searches, too. Pretty crazy stuff happens here, I tell you. These are too funny! What's with the uteruses and flying squirrel skeletons?!? Song lyrics...emergency situation....song lyrics....emergency situation...tough call. I like the jeopardy one, too! This is too funny! I haven't mastered Google analytics yet, so I haven't looked at the search terms. I'm a little nervous about what I'll find!